Known for exploring the theatrical effect of combining abstract structure with animated life forms, Philomena also loves to paint and draw. An excellent draughtsman, Philomena likes to relax by producing whimsical portraits of family and friends. Member of Animatronics Team Pinewood for films: ‘Aliens’: Director James Cameron: 20th Century Fox & ‘Little Shop of Horrors’: Director Frank Oz: Warner Bros.
Oriana: Davidson Davis who among her other accomplishments had created the titular monster of the 1986 film Aliens was to advise on sculptures to take place on board. 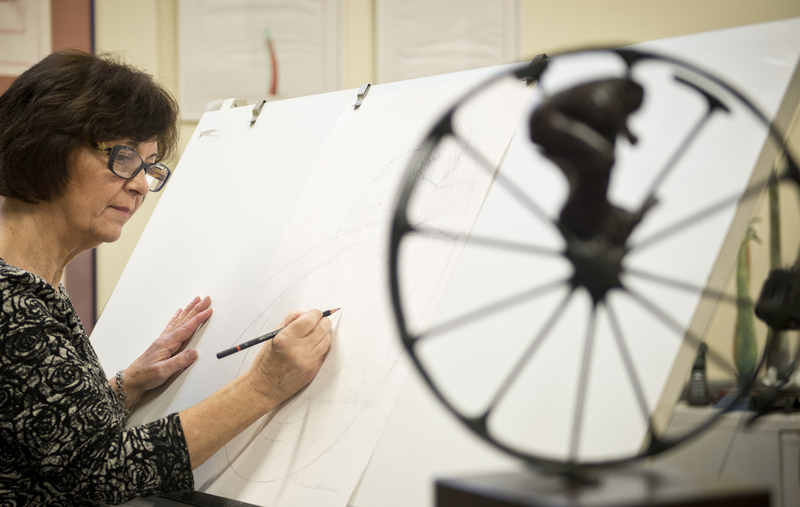 Philomena working on a sculpture in bronze titled "Fairway" commissioned by Sir Peter Michael CBE for Donnington Valley Hotel & Golf Course, Newbury, UK.